Genuine Ace replacement main HEPA filter for your Ace portable welding fume exractor. Package of 6 - Genuine Ace Pre-Filter for your Ace portable welding fume extractor. Ace 10 foot replacement/extension hose for your Ace portable welding fume extractor. 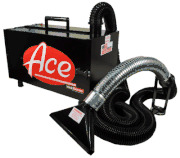 Ace portable welding fume extractors are perfect for spot removal of welding fumes in small industrial and home shops. These lightweight welding fume extractors go just about anywhere and come complete with disposable HEPA filters.